At just three miles long and half a mile wide, Harbour Island can only be accessed by boat with no direct air route. 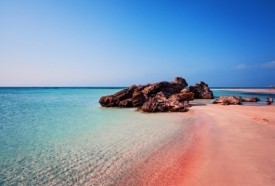 Its pink sand beaches that run along the eastern side of the island make for a popular vacation destination for tourists from around the world. A microscopic organism with a pink shell called foraminifera is what causes the beaches to be such a striking hue. Life moves a little slower on Harbour Island, and this slow pace provides a friendly and inviting atmosphere to all who visit.